This special free promotional jumbo card advertised 3 new Rockman titles headed for release in December of 1992: Rockboard, Rockman 5, and Rockman World 3. 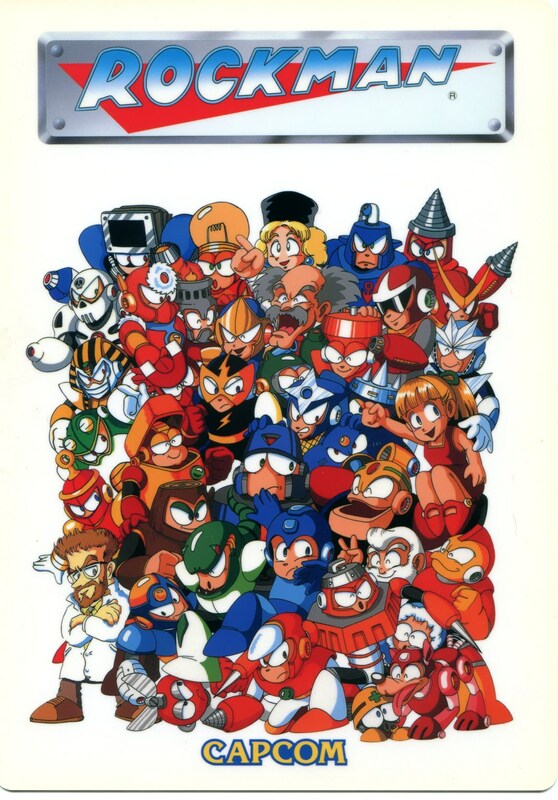 The front uses the same art as the Rockman 1-3 and World group picture, extended with art from the characters of Rockman 4 thrown in on the top and left. Would be interesting to try and visualize how this would look if they’d kept going adding characters all the way until R10. Art project, anyone? Here’s the reverse with the ad stuff. Back of 1992 Rockman promo card. Wily & Right’s Rockboard: That’s Paradise! Challenge Dr. Wily and other familiar Rockman characters to a board game! Rockboard Famicom Software Coming Dec ’92 for ¥6,500 (tax excluded). Rockman 5: Blues’ Trap!? Latest and greatest in intense action. The strongest installment the series finally arrives! 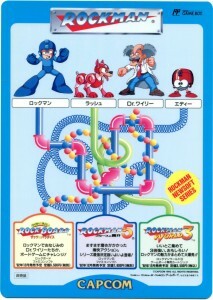 Rockman 5 Famicom Software Coming Dec ’92 for ¥7,800 (tax excluded). Rockman World 3 Assembling the best for 3 times the power, 3 times the fun! Rockman World 3 Game Boy Compatible Cartridge Coming Dec ’92 for ¥3,500 (tax included). I wonder why suggested prices on GameBoy titles include tax and Famicom ones don’t? It’s wild that they wanted to release that many Rockman titles in the same month, however Rockboard would end up being delayed until January of ’93 in Japan (and released nowhere else). Mega May on Virtual Console puts that number of releases to shame, though. 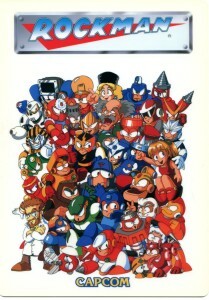 1 Comment to "Pile Up Pipe Dreams"
Well, you have the “Rockman Puzzle” ilustration for R10. But, why Quint isn’t there? Maybe his artwork doesn’t fit, Dive Man’s face either too.